Still looking for the best gifts for your beloved men on special anniversary? 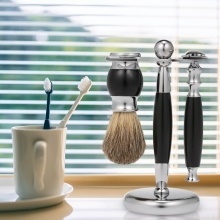 Our Luxury Grooming Shaving Set is the best solution to it. A complete shaving set to give men perfect shaving experience and a happy mood, making them confident in all day. Removable and replaceable razor head and blade, this double edge razor is really easy to change and wash. The brush is made with high quality hair is gently and soft to your skin, turning your shaving into a luxurious barber-like experience. Weighted base for stability with Rubber like, non-slip sole, it helps to facilitates air drying for longer brush/razor life and better hygiene. A wonderful gift for your dear father, beloved boyfriend or husband on special days. A necessary shaving set for men&apos;s beard and hair cleaning. Note: Pls kindly note that the safety razor blades are not included in our package.